I had the chance to attend the Liberty Media Internet Leaders conference the week before last. Alot of people don’t know who Liberty is but it has to be one of the smartest media companies out there. Ranging from its investment is Serius/XM radio to IAC, these guys have done some great deals over the years. John Malone, Chairman of Liberty Media, Greg Maffei, President and CEO of Liberty Media, were two of the speakers and used the term The Great Reset a number of times to talk about what we are going through. After starting my work through the 10 books about the Great Depression, I not only have been reading a few books about new companies and innovation, but I decided to get myself through a few about the Great Reset. I just finished A Colossal Failure of Common Sense: The Inside Story of the Collapse of Lehman Brothers by Lawrence McDonald. McDonald was a distressed debt trader at Lehman and saw the crash from the inside through the lense of someone who traded on the failure of other companies who took on too much debt. Lehman is a very old trading house that started as a cotton broker in Montgomery, Alabama so I have always followed them a bit. In fact, I think I was on the phone with a great banker from there just months before the failure. It is a nice piece that shares how Goldman envy (somewhat like IBM envy in the tech business) lead Lehman to fail. Trying to out IBM, IBM has killed a few and trying to out Goldman, Goldman has the same result. 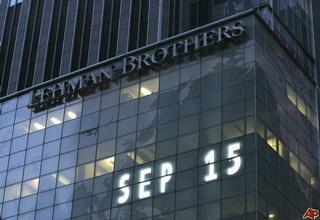 The risks that Lehman was taking was not alot different that the consumer was taking in the real estate market. The difference being while a consumer was buying a million dollar home with 110% debt, Lehman was buying 100’s of billions of dollars of this debt with 95% debt with risky structures that meant for every 1% drop in value, Lehman could lose 20% of its equity. So a 20% drop in value meant Lehman was losing 400% of its equity, in other words a real estate crash would bankrupt Lehman. Which is exactly what happened, just over a year ago. This entry was posted in Great Depression, Politics and tagged cotton broker, debt trader, greg maffei, lehman brothers. Bookmark the permalink.